We've set this corner of the Internet aside as a Museum of Early Video Editing Equipment and Techniques. We hope to serve three goals with our museum. Our first goal is to save a bit of the history before it all goes into a land fill. Our second goal; For those that have "been there, done that", to give you a chance to revisit that time and equipment. Our final goal; For those that have entered video editing more recently, to let them see how the equipment and techniques they use today were developed. AMPEX VR-1000 Of course, before we could make that first edit, we needed the video tape. 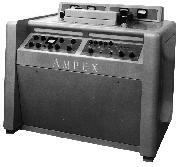 And in 1956 Ampex stepped up with the VR-1000. While not the first Video Tape Recorder (VTR), the VR-1000 was the first, practical, broadcast quality recorder. The VR-1000 recorded a black and white picture with a mono audio channel on a 2" wide video tape. The tape ran at a familiar and economical 15-inches per second. The picture was recorded across the tape from top to bottom using four heads on a rotating drum (Quadruplex recording). This arrangement gives an effective video recording speed of approximately 1560 inches per second. Editing film and audio tapes were the accepted norm, and if the VR-1000 recording was to be useful, it to had to lend itself to being edited as well. And indeed it did. It could be spliced in much the same way that audio tape was. It required more care, since you were editing both audio and video, and for the splice to play smoothly on-air (no roll, or breakup on the screen), the splice had to be made at a very precise spot on the tape. and accessories To make the technically "perfect" splice, you first "developed" the tape. This was done so that, with the aid of a microscope, you could see where to make the cut. The "developer" is a solution containing fine metal particles that are attracted by the magnetized areas of the video tape. You then used the guillotine knife to cut the tape. Finally the splice was completed by using 3M video splicing tape to join the two ends. So, now with the Smith Splicer, we could make technically correct edits, but HEY, this is state of the art electronics, why not make the edit electronically? Good question, and one that Ampex soon answered with the "Electronic Editor". This allowed us to make "splices" electronically. But there was a small problem... The operator had to press the Record button exactly 1/2-second before the edit was to take place. The smallest mistake and the edit would be in the wrong spot, and worse, there was really no way to correct it! Control Panel While the Electronic Editor was a great tool, it left too much to luck, and so Ampex once again came to our rescue with the "Editec". For the first time we had frame accurate edits, the ability to do previews, and the ability to trim an edit and we could even trigger external devices (such as starting an audio tape machine). At this point, video tape was missing one thing. That was a way to uniquely identify each frame, as had been available in film for years. Thanks oddly enough, to the cold-war and the need to develop missiles, we got Time Code. Time code is an electronic signal that is added to the video tape, which identifies each frame. With Time Code, you could search for a specific frame, use it to do frame accurate and repeatable edits, synchronize video with audio, trigger audio and video switcher, and much, much more. One of the first companies to provide Time Code equipment was the Electronic Engineering Company of California (EECO). Their equipment was based on the timing equipment they supplied to the military for use in missile testing. EECO-900 EECO also created the EECO-900 editor which used their "On-Time" time code. The EECO-900 replaced the Ampex Editec in a VR-2000, and gave the user much greater control and flexibility over the editing process. The EECO-900 soon became one of the most popular editors in the Hollywood post production market. CMX-300 System The last significant advance in editing came with the computer. 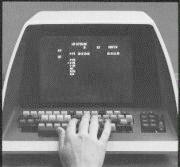 The CMX-300 was one of the first computer based editing systems. It allowed the user to control both the VTRs and audio and video switcher. It created a list, provided auto-assembly, and was the first editor to use Time Code for color framing. We hope you've enjoyed this brief look at the early history of video tape editing. For more detail, please take a look at some of the other pages we've included.